ORCID.org aims to solve the name ambiguity problem in research and scholarly communications by creating a central registry of unique identifiers for individual researchers and an open and transparent linking mechanism between ORCID and other current researcher ID schemes. These identifiers, and the relationships among them, can be linked to the researcher's output to enhance the scientific discovery process and to improve the efficiency of research funding and collaboration within the research community. As researchers and scholars, you face the challenge of distinguishing your research activities from those of others with similar names. You need to be able to easily and uniquely attach your identity to research objects such as datasets, equipment, articles, media stories, citations, experiments, patents, and notebooks. As you collaborate across disciplines, institutions and borders, you must interact with an increasing number and diversity of research information systems. Entering data over and over again can be time-consuming, and often frustrating. ORCID is an open, non-profit, community-driven effort to create and maintain a registry of unique researcher identifiers and a transparent method of linking research activities and output to these identifiers. The platform reaches across disciplines, research sectors and national boundaries. It is a hub that connects researchers and research through the embedding of identifiers in workflows, such as research profile maintenance, manuscript submissions, grant applications, and patent applications. APIs that support system-to-system communication and authentication. ORCID makes its code available under an open source license, and will post an annual public data file under a CC0 waiver for free download. The Registry is available free of charge to individuals, who may obtain an identifier, manage their record of activities, and search for others in the Registry. Organizations may become members to link their records to the identifiers, to update records, to receive updates and to register their employees and students for identifiers. Records hold non-sensitive information such as name, email address, organization and research activities. It is possible to control how this data is shared, and tools are provided to manage data privacy. With ORCID’s Auto-Update service, if you include your ORCID iD when you submit a manuscript or dataset, your ORCID record will automatically be updated when the work is published. Auto-update of your ORCID record only works when you give Crossref or DataCite permission to do that. How do you make Auto-Update happen for datasets? Include your ORCID iD in the descriptive metadata of your dataset when submitting your dataset to 4TU.ResearchData. Step 2. Click 'Sign in' at the top right corner. Step 3. Sign in with your ORCID account and click ‘Authorize’. More information You can find more information about ORCID and its Auto-Update service in this news item. From your ResearcherID menu you have the option to link your ResearcherID to your ORCID. Extra visibility without double work. 1. The single most important thing to do is to to use your ORCID iD and make it work for you, for example, to enable auto-updates from other systems such as ResearcherID, SCOPUS and, shortly, CrossRef which to date has issued over 75 million digital object identifiers (DOIs) for articles, book chapters, images, and more (more on that in a future post). So keep your information updated, include your iD when prompted to do so in manuscript submission systems, grant applications, and other research workflows, make sure it’s linked to other identifiers and profiles you use, such as ResearcherID and Scopus, and include it in your CV, your web page, your signature line, and more. 2. Next, take an extra 30 seconds to add your affiliation as well as all the variations of your name in your record. This could include any abbreviations you use professionally (initials and/or a nickname, for example) as well as other names you are or have been known by. ORCID is set up to allow as many different names, variations, and combinations of names as you need! Without this extra data, anyone searching for you by name alone will still be unable to distinguish you from someone else with the same name as you. 3. 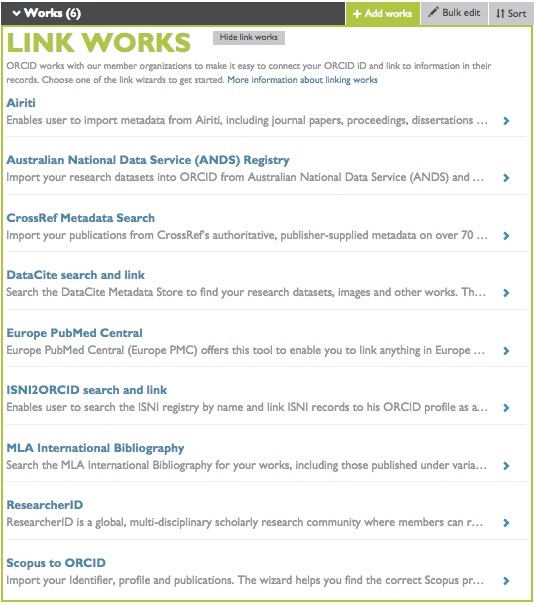 It’s also helpful to enhance discoverability of your existing works by using our search and link wizard to connect information about your research outputs to your ORCID record. This ensures you get the credit for it - and you’ll also be able to quickly and easily provide that information when applying for jobs, promotion, tenure, grants, and more. 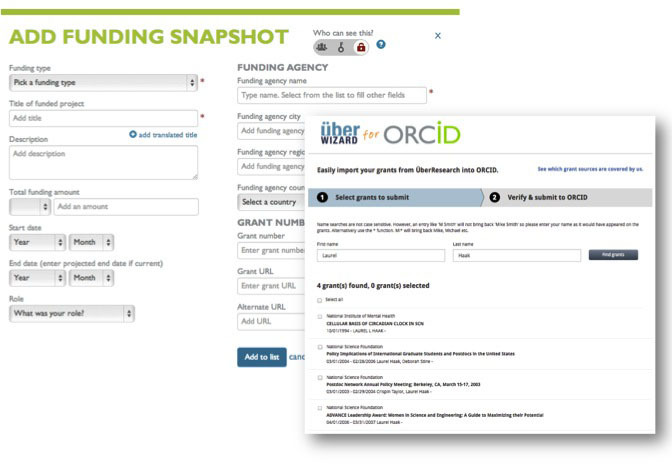 You can also use the Uber wizard to add details of your funding. 4. Another smart thing to do once you’ve got an ORCID iD is to add it to your social accounts - whether you’re a tweeter, a Wikipedian, a Facebooker, or active on LinkedIn, academia.edu, Mendeley, ResearchGate, or many more. Some social tools, like Wikipedia, provide instructions on how to add your ORCID iD, and pretty much all of them include an option to add a website - so why not add your ORCID url? 5. Your ORCID iD comes with its very own QR code, so don’t forget to download and use that too! 6. 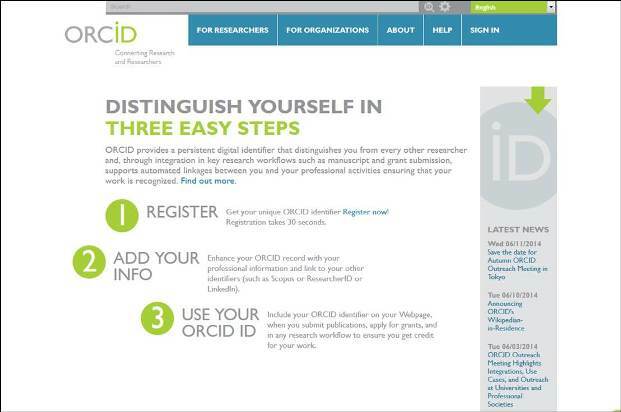 Last but not least, tell your colleagues you’ve got an ORCID iD and encourage them to get one too. The more people who register - and use - ORCID the more we will be able to fulfil our goal of solving the name ambiguity problem in research and scholarly communications.